Labor Day came at the perfect time during my treatment. My poor skin needed the break. I did, too. And, I am. I’m just worn out. I guess it is the radiation. They said it would cause fatigue, but I kind of rolled my eyes at that. I mean, nothing can compare to chemo, right? Well, I still believe that, but the difference between chemo and radiation is that you plan to feel terrible during chemo. You make accommodations in preparation for that. We did nothing during my chemo treatments. We just hunkered down and tried to plow through it. With radiation, you don’t have that sick piece, so life and expectations go back to normal — kids’ activities, gatherings, work, back-to-school stuff. Life resumes. But, even though I’m not popping nausea meds every few hours, I’m dog tired. It is hard to remember that I’m not supposed to be running at 100 percent. All of that said, I am so close to being done! I have completed 25 of 35 treatments. Even better, my last six treatments are only focused on the mastectomy scar. That means I only have three more treatments to my entire breast area. Woo hoo! The picture doesn’t do it justice. It’s very red and tender – like a really bad sunburn. This goes all the way down below my expander, all the way into my armpit and around to my back. Another thing I’ve noticed is that my muscles seem to be weak and sore in that area. I tried to lift a chair tonight and didn’t have the strength in my arm. My poor body has a lot of work ahead to get my strength back. 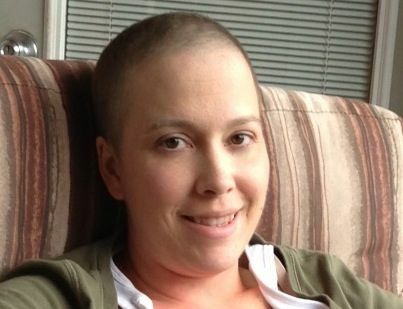 But, chemo is becoming more and more of a distant memory. And my body is moving on. Know how I know? See the white line of my fingernail below? That’s the line where I started chemo. 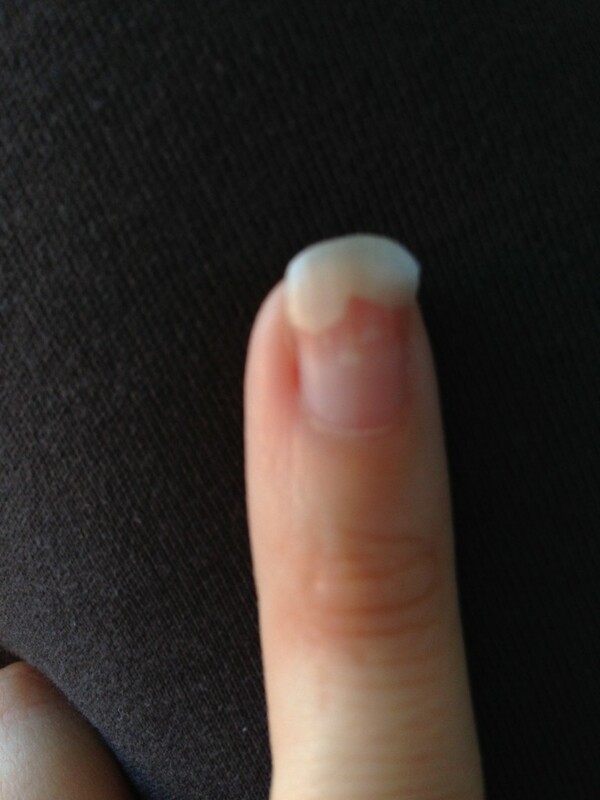 All of the nail below that is healthy nail. It is kind of like my tree ring. 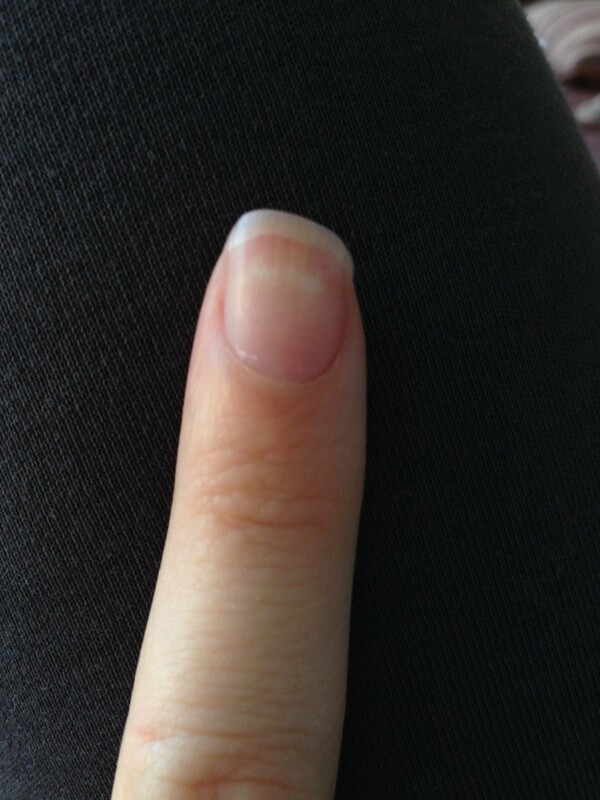 That uneven white part is where the nail is detaching. Gross, huh? Hard to tell in the pic, but I’ve also got some decent hair growth going on. I’m not sure I’m ready to be sans scarves though. I hate wearing them. They are pain to match with clothes. They are hot. And, I’m just ready to have hair again. Alan swears it is long enough to stop wearing the scarves. I kind of agree with him until I see pictures where it looks like it is barely there. Then, I think that he and I are just so used to seeing me bald (I never wear scarves or a wig at home) that any little bit of hair seems Rapunzel-length to us. So I went to the grocery store without a scarf today — just to test it out. There were a LOT of second and third takes. When your hair looks like Sinead O’Connor, people don’t follow the second/third look with a look of understanding. It’s more of a “what-in-the-world? !” kind of look. I haven’t made up my mind about whether I care about the second/third looks. It wasn’t comfortable. Then again, what about cancer is comfortable? This entry was posted in Chemo, Radiation by jenny. Bookmark the permalink. I think you look great without the scarf! As for the detached nail, try putting Vicks rub under the nail before you go to bed for a few nights – sounds crazy I know! I usually just stick my finger in the tub of Vicks and wipe of the excess. 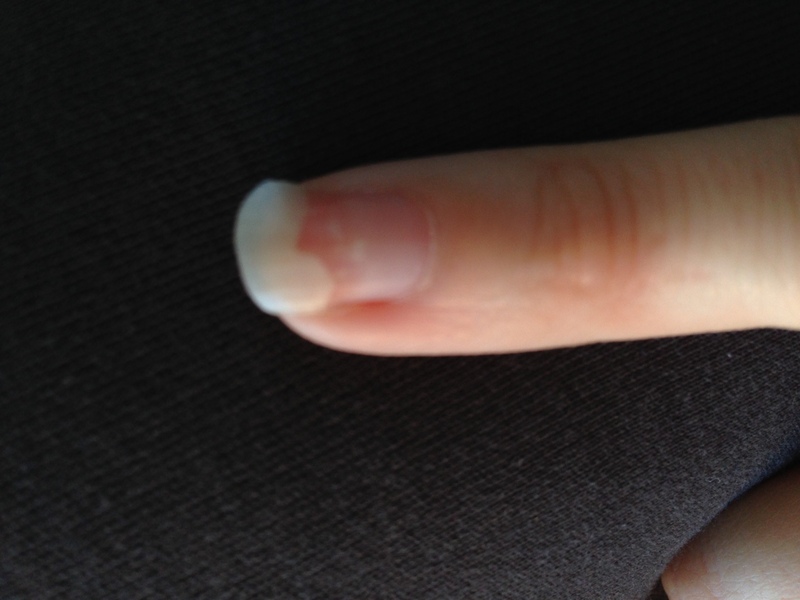 It works to heal the quick and re-attach the nail – a trick I learned from a nail tech. I’d be curious to see if it helps heal yours since it was essentially caused by the chemo. Oh sweetie, your strength amazes us all. You have been through so much this past year and you have pushed through it like a warrior, even if you don’t always felt so strong. You will get through these last treatments and you will be done. And if you ever doubt your strength, just look in the mirror. That girl looking back at you is the most beautiful, giving, strong soul I know — and you have so many people that love you and are pulling for you to get through these last treatments. And Lorrie is right. You rock the barely there look. I bet those scarves are a pain. I say ditch them. Honestly, you do not look like a punk girl. (You do not have the clothes or piercings associated with such a look. lol) You look like a survivor…and THAT is beautiful. Chin up, gorgeous. If anyone can get through these last ten treatments, it is you. You’ve got this in the bag. You can totally rock it! So close to another step behind you. You are amazing! Tell me if the Vicks trick works. Never heard of such a thing! Love you tons. I think you look great, too. I’m sure it feels better to be free and cool on top. The treatments will be over soon — and you’ll be your strong, healthy self again. Those strangers who stare should walk in your shoes for just a few days. Perhaps they have.